Nuclear missile weapons remain Russia’s chief means of deterrence ‒ the final argument in a possible large-scale military conflict. The international situation, however, which is characterized by an increasing number of localized wars, is creating a demand for non-nuclear weapons that can be used to achieve strategic objectives from time to time. Toward the end of November, when commander of Russia’s strategic missile forces, Col. Gen. Sergei Karakayev, was commenting on the results of military training exercises in 2012, he confirmed that Russia was developing advanced missile systems, including a new intercontinental ballistic missile (ICBM). “This year, as part of the State Weapons Program for 2011–2020, we have been working on creating advanced missile systems and, in particular, a heavy-class missile,” the commander said. The military operational requirement for the development of a new heavy ICBM was approved in 2011. The lead developer for the new missile was the Makeyev State Rocket Center (Miass, Chelyabinsk Region). The military-industrial corporation NPO Mashinostroyenia (Reutov, Moscow Region) is also involved in the development project. The missile will be manufactured by Krasnoyarsk Engineering Works. Still, no matter what exceptional potential the new missile or nuclear warhead might have, it is impossible to fight with nuclear missiles unless the objective is to destroy all life on the planet. It is, however, still necessary to fight and to fight effectively, with minimum losses and maximum results. The Iranian “nuclear crisis” (and the possible use of non-nuclear weapons to resolve the issue by force), as well as the latest Israel-Palestine confrontation serve as graphic confirmation of the fact that strategic objectives can also be achieved with non-strategic weapons. In the final decade of the last century alone, the world experienced 34 major and minor wars, including an international war in the Persian Gulf, two campaigns in Chechnya and a large-scale war in Yugoslavia. There were also unseen terrorists, whom the fight against has become a super-objective for the entire planet. In other words, there is no way to get by without weapons. Recent armed conflict has been characterized by brief combat operations that take place within a limited area and without a clearly defined front line, and this trend is likely to continue in the future. It must be said that, in both America and Russia, there is a heightened emphasis on improving conventional weapons. Thus, the U.S. decided a few years ago to focus on plans to create penetrating ammunition capable of dealing a guaranteed blow against highly defended underground enemy targets. 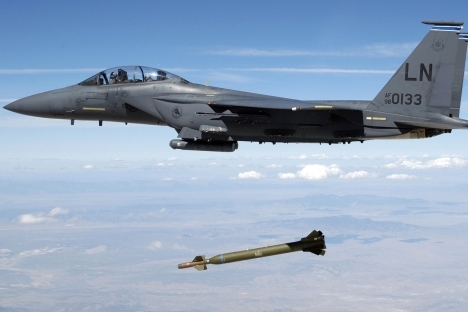 In anticipation of possible combat operations in Iran, the U.S. Air Force armed itself with the so-called Massive Ordnance Penetrator. This penetrator turned out to be a 15-ton monster, designed to destroy the underground structures where Americans think Iranian nuclear weapons might be housed. Incidentally, its “parent,” the GBU-28 bomb, developed at the end of the 1980s, very nearly blew Gaddafi himself, in his bunker residence in Bab al-Azizia, to kingdom come in August 2011. According to NATO intelligence, the leader was supposed to be there, having been lured there by his treacherous deputy head of intelligence, Khalifa Muhammad Ali. Thirty minutes before the attack, however, Gaddafi left the bunker with his sons and his closest associates. Russia, for its part, decided to strengthen its position in the area of so-called “vacuum” bombing. Resonance testing of what is still the most powerful vacuum bomb in the world was carried out in fall 2007. The U.S. used vacuum munitions as far back as the 1960s in Vietnam. Russia fired shells from its TOS-1 flamethrower rocket-firing vehicle at mujahedeen positions in Afghanistan; the shells contained a thermobaric mixture that operated on the same principle as the U.S munitions. Russia later used the same shells in a conflict against Chechen separatists. The aerial thermobaric bomb features a container (or containers) of an explosive mixture based, for example, on volatile hydrocarbons. When it hits the target, or when the ammunition explodes above the surface, the mixture is released. When the mixture combines with oxygen in the atmosphere, it forms a very powerful explosive cloud that detonates within 100-140 milliseconds of being released. In such an explosion, excess pressure, which can reach 6.1 pounds per square foot, is created by the shock wave as it advances at a supersonic speed of 1.8 miles per second. Conversely, a deep vacuum is formed in the wake of this wave, capable of sucking in air and solid particles like a vacuum cleaner. The ability of the fuel-air mix to damage or destroy an obstacle is very low. However, for a person, it is probably difficult to imagine a more deadly weapon. When it explodes, anyone who does not die in the flames is subjected to the effect of a very powerful shock wave and vacuum. This kind of weapon is becoming the main mode of fighting enemy troops. It will, perhaps, be prioritized by those who are drawing up future military plans.